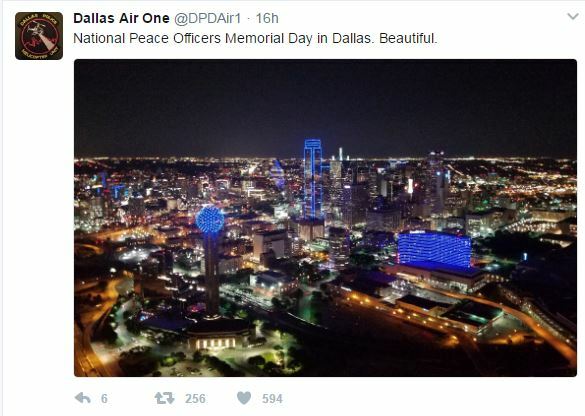 On Monday, May 15, 2017, the Dallas Skyline turned Blue in honor of National Police Day. The Department’s own Air 1 was able to capture the beautiful image from up above and shared it with everyone via Twitter. The tweet received over 200 retweets and was liked 594 time. The Dallas Police Department appreciates the continued support from the community. The lighting of the Dallas Skyline blue was organized through the Honor our Heroes Partners. The department is proud to partner with these organizations who came together to honor police on National Police Day.